Hotel like former foreigner mansion house. Converture Yoyogi-Koen opened on November 2012 after fully renovating a rental mansion for overseas celebrities. The main charm is the spacious living room with a high ceiling. Tenants of this share house are between their 20's and early 40's, and most are working. Their occupations vary such as IT, medical and service industry, etc. All are cooking-lovers so we fully equipped the kitchen. Most tenants are independent adult women who enjoy their private time while also maintaining a comfortable and cozy distance with other tenants. It is suitable for people who have never lived in a share house and has worries about the share house lifestyle ? 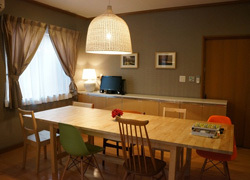 the 22 tenants are people who have experienced share houses overseas, moved from individual housing rent to the share house, living alone for the first time, or have moved to Tokyo from afar. It is also popular to active tenants who commute to their work site by bike. 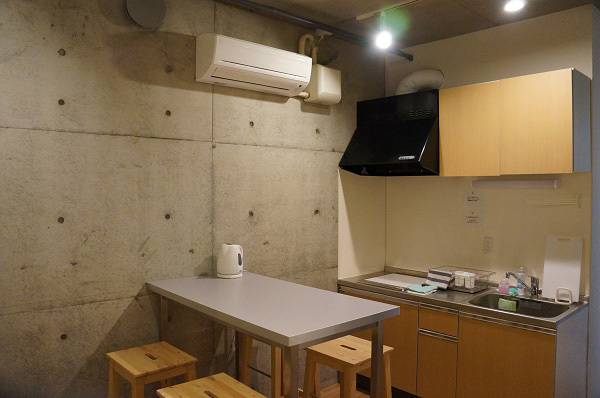 By the way... some tenants call Converture Yoyogi-Koen “a house that brings love” ? perhaps it has something to go with the good energy coming from Yoyogi-Koen. 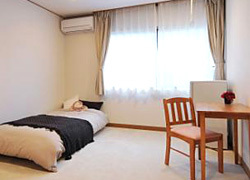 8 minutes walk from Yoyogi-Koen Station (Chiyoda-line). 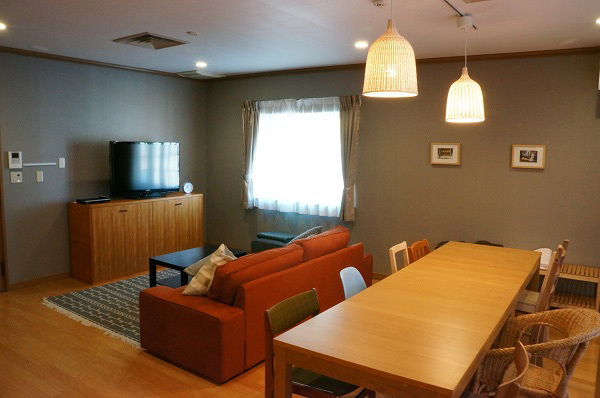 8 minutes walk from Yoyogi-Hachiman Station (Odakyu-line). 10 minutes walk from Hatudai Station (Keio-line). 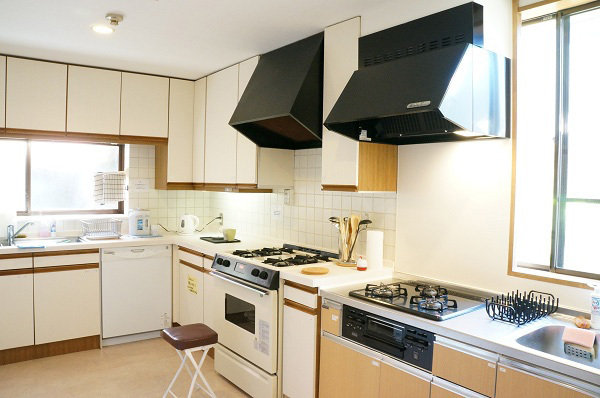 1st floor main kitchen (7 burner stove, sinks×2), Basement kitchen (IH), Steam oven rang×1, Microwave×2, Gas oven, bread machine, Dish washer, Large size refrigerator, Oven toaster×3, Rice cooker×3, Electronic grille, Tako-yaki machine. 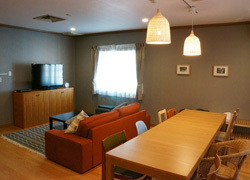 46-inch TV, 32-inch TV, DVD player, Shared PC, Sofa, Dining table, Heating and air conditioning. A large size comfortable sofa is placed in the spacious living room. There are 2 dining areas for eating. 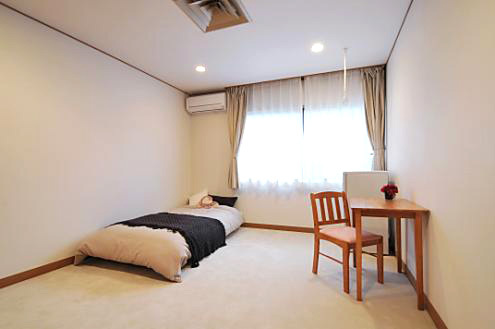 All necessities are fully-equipped, such as bed, refrigerator, etc. 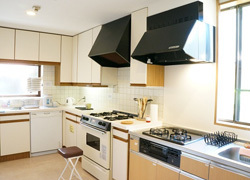 The main kitchen, fully-equipped with large size oven-microwave, dish washer, etc. 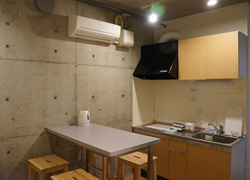 There is a sub-kitchen in the basement. 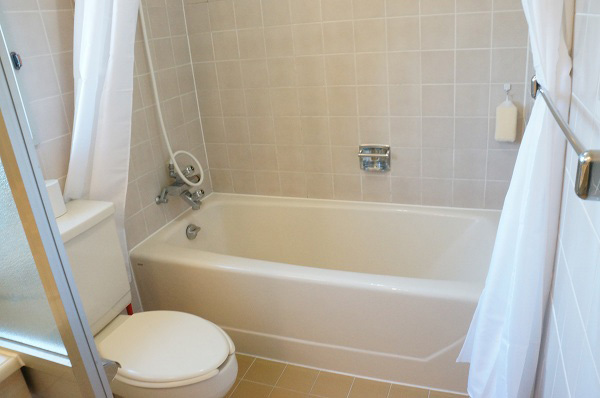 A bright bathroom with a window.